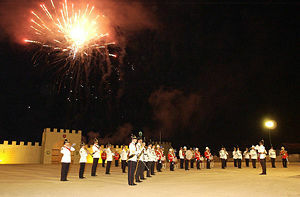 The Minden Band of the Queen's Division on parade in Cyprus, 2002. A military band is a group of personnel that perform musical duties for military functions, usually for the armed forces. A typical military band consists mostly of wind and percussion instruments. The conductor of a band commonly bears the title of Bandmaster or Director of Music. The military band should be capable of playing ceremonial and marching music, including the national anthems and patriotic songs of not only their own nation but others as well, both while stationary and as a marching band. Military bands also play a part in military funeral ceremonies. During the American Civil War most Union regiments had both types of groups within the unit. However, due to changes in military tactics by the end of World War I field musical had been mostly phased out in favor of the brass bands. These performed in a concert setting for entertainment, as well as continued to perform drill and martial events. In the United States, these bands were increased in instrumentation to include woodwinds, which gives us the modern military band in the United States, as well as the basis for high school and college marching bands and concert bands. Field music is still popular at ceremonial functions, with many organizations such as police, fire, and veterans groups maintaining pipe and drum, fife and drum, or drum and bugle corps. There are two types of historical traditions in military bands. The first is military field music. This type of music includes bugles (or other natural instruments such as natural trumpets or natural horns), bagpipes, or fifes and almost always drums. This type of music was used to control troops on the battlefield as well as for entertainment. Following the development of instruments such as the keyed trumpet or the saxhorn family of brass instruments, a second tradition of the all brass military band was formed. Ottoman military bands: These are thought to be the oldest variety of military marching band in the world. Though they are often known by the Persian-derived word mahtar (مهتر ; mehter in Ottoman Turkish) in the West, that word, properly speaking, refers only to a single musician in the band. In Ottoman, the band was generally known as mehterân (مهتران, from the Persian plural mahtarān), though those bands used in the retinue of a vizier or prince were generally known as mehterhane (مهترخانه, meaning roughly, "a gathering of mehters," from Persian "house of the mahtar"). In modern Turkish, the band as a whole is often termed mehter takımı ("group of mehters"). In the United States Army, the band is attached to the headquarters element and one of its duties is to provide security for the command post. United States Service Bands: Each of the branches of the U.S. Military has a delineated structure of bands programs. Today, the service band organizations frequently consist of direct support bands on military bases. Seven organizations are considered to be "premier" bands, in which members are selected by screened competitive audition prior to enlisting in the particular service. Members of these premier bands come from the finest conservatories and schools of music in the nation. There are also military bands assigned to specific military units and the military service academies. Regular British Army musicians are all members of the Corps of Army Music. The four bands of the Royal Armoured Corps amalgamated into two. The Band of the Royal Irish Regiment disbanded from regular service. The Band of the Royal Regiment of Scotland formed by amalgamation of the Highland Band and Lowland Band. The new Minden Band of the Queen's Division formed by amalgamation of the Minden Band and the Normandy Band. The new Band of the King's Division formed by amalgamation of the Waterloo Band and the Normandy Band. The new Band of the Prince of Wales' Division formed by amalgamation of the Clive Band and the Lucknow Band. As a secondary role they are trained to work in NBC 'Casualty Decontamination Areas'. Modern-day military musicians often perform a variety of other styles of music in different ensembles, from chamber music to rock and roll. During World War II, The Royal Air Force Dance Orchestra, better known as The Squadronaires, served to entertain troops and support morale. The term "military band" may also be applied to civilian marching bands that play military-style music, march in mostly straight-line formations and have similar instrumentation. This page was last modified on 5 October 2018, at 15:04.